Ecommerce email marketing provides staggering 4,300% return of investment so it is no wonder it’s one of the most popular marketing channels for many online stores. 125 is the average number of emails sent and received per user in a day in 2015. And that number can only be expected to rise as email campaigns become easier to personalize and send out for marketers and access becomes more convenient for recipients, thanks to growing access for mobile devices. If they are not in front of their computers, they are likely to check their emails on their smartphones or tablets. Although one can argue that social media is where people spend a great deal of time at in recent times, no one can deny the tangible results and benefits of email marketing. In this article, we will discuss the 9 important ecommerce email marketing campaigns you should run. Sending post-purchase emails is a great way to nurture relationships with your customers. It allows you to stay engaged with your customers even after they have successfully bought a product from you. We recently discussed a post-purchase email campaign by Dyson in our article on product reviews. The brand sent out a series of four emails to their customers at set intervals with each email having a specific marketing objective. While most brands would stop at one or two emails, the brand simply kept on going, sending two more emails two and three months after the purchase was made. What can we learn from this ecommerce email marketing campaign? Your post-purchase email should mature. Lessen the hard sell and simply show that you care for your customers. Send out insider tips and practical ways that will let your customers maximize the value of their purchase. Especially when the purchase made is fairly recent and your customers may not be ready for another one yet, switching your tone from hard selling to nurturing is very much welcome. Your post-purchase email can take different forms and it does not necessarily have to be about requesting product reviews from your customers as is often the case. Be creative with your post-purchase email objectives, like educating your customers. You can share with them video tutorials uploaded on your YouTube channel or product care tips published on your company blog. This not only allows your customers to get more value out of their purchase, but you also get to establish your authority in the field. It’s also a fantastic way to drive traffic to your site. Analyze your average time in between purchases and use it to map out your email campaign strategy. This way, your email is sent out not too early or not too soon to your customers. Thanks to triggered emails, you can use an ecommerce email template, customize it, and set it up to be sent at the perfect time automatically. And based on email marketing statistics, triggered emails have higher ROI than batch emails even when these are sent at low volumes. With post-purchase emails, you can build and nurture the relationships you have with your customers. There is always that possibility that they will buy from you again, so until that happens, keep your brand top-of-mind with creatively written post-purchase emails. Not everyone who adds products in a shopping cart convert into a customer. And while it is impossible to convert all 100% of them into paying customers, you can engage with them again through email. Refresh their memory of the products inside their abandoned cart by itemizing what those are in the email. It is also a great idea to make each of those products clickable with a ‘Buy Now’ button so your potential customers can easily view them and proceed to checkout. Offer a discount to encourage your potential customers to complete their purchases. One of the reasons why shopping carts get abandoned is because of the price. Users may feel apprehensive to proceed to the checkout page if they can get the same item at a lesser price somewhere else. Giving them a discount may help you win them over. Give them every reason to proceed with their purchase. If you do not want to give out a discount, you can be creative with your abandoned cart email by giving the different reasons why they should shop from you. Like Drugstore.com, you can list down what separates you from other online stores, like you have free shipping when a certain order value is met, you have rebates, your product selection is wide, and your site is secure for online shopping. Give them other options. Aside from the price, it is also possible that that your potential customers are not 100% sure about the item they placed inside their shopping carts, hence abandoning them. Be open to that possibility and show them similar items that other customers have already purchased. The fact that other people have bought items similar to their initial choice can help them proceed with their purchase. Use elements of urgency and scarcity so your potential customers are more motivated to take action. Although you can manage to keep abandoned shopping carts active in your system, placing an expiration date of sorts can help you win those conversions earlier. Bonus: Make your abandoned cart email campaigns effective with these five steps. This is your second chance to win potential customers back, so make sure to create a great impression. Product reviews are great features to have on a product page. It can increase your conversions and improve your rankings on search engines. One way to get these reviews flowing in is to request for them from your customers through an email. With 61% of customers reading online product reviews first before making a decision, not having enough of these available on your site can be a big mistake. Reference this guide on emails asking for product reviews to ensure that your requests are created, sent, and received in a timely manner. On the other hand, below are email marketing examples you can take inspiration from as you strategize your own. Zappos is a company known for their customer service and clever marketing. For their emails requesting product reviews, their approach is to let their customers know that their insights are valuable because it will help millions of Zappos customers create better shopping decisions. The email comes with clickable ‘Write a Review’ links in the message area and another call-to-action button, which reads ‘Yes, I want to help!’ that also leads to the same product review page. Make these links and call-to-action button available so it is easy for your recipients to send in their opinions. A great way to motivate customers to send in their reviews is to give them a token of appreciation in exchange for one. Although it is not really a gift, but The Container Store gives their customers a chance to win $750 if they care enough to share a product review. Be careful about product reviews that come with incentives as others might confuse it as a token in exchange of a good review than an honest one. Make your customers feel like they are a part of an exclusive group whenever they make product reviews, like Sephora’s Beauty Insider where customers can shop, rate, and organize all their favorite product from Sephora. Like Zappos, their manner of requesting product reviews has a way of making customers feel valued and important. This emotional connection can serve as motivation for your customers to send in their reviews more gladly and willingly. One smart way to make your ecommerce email campaigns effective in boosting trust and adding credibility in your products is to add social proof. Social media today is like the digital version of word-of-mouth advertising and you can borrow content (e.g. comments, visitor posts, star ratings and review) from your Facebook, Twitter or Instagram page and use it as testimonials in your emails. In this social proof email by Petflow.com, they used a customer rating testimonial from Amazon and also inserted a YouTube video of the product being used in action. This helps validate the claim of their Pet Corrector product, which is to stop barking effectively. They also included a 50% discount for the product, enticing recipients at buying the item. Also in the email are comments about the product on Facebook. Maximize user generated content and let your customers help you sell your products to others. On a similar note, taking of advantage of the pulse and what’s trending on Facebook, Twitter, and Pinterest is Crocs. They sent out an ecommerce email to their customers showing the popular shoes for fall season per social media channel. The email also had ‘Shop Now’ buttons that will easily take the recipients to the product pages just in case they want to buy the shoes. Especially if you have a loyalty or rewards program for your business, one of the ecommerce email campaigns you should run is a rewards email that contains rewards updates or the latest events happening in your store. You can start it off with a welcome email and use succeeding opportunities to send out updates on new store offerings or new promos exclusive to rewards program members. In this rewards email by Distributor Advantage, they share the key benefits of being a part of their rewards program and the mechanics on how to accumulate points. They also have a link that will take the customer straight to their rewards account if ever they want to check their balance of collected points. The benefit of email marketing in this scenario is it acts as an extension of your company-wide initiatives. As a brand, your goals are to increase your sales and foster customer loyalty, and email marketing can help you build incredible returns of investment. Another benefit of sending rewards emails is you are able to guide your customers in their journey to earn more rewards from you. It’s not a one-off email welcoming customers into the program, but a series of emails that constantly adds value to your customers’ loyalty to your business. With birthday emails generating transaction rates 5 times higher than regular emails, you might be losing a great deal of potential growth if birthday emails are still not part of your ecommerce email marketing campaigns. And while it is thoughtful and sweet to send your customers an email greeting them on their birthday, consider sending them birthday emails at the start of their birth month or even after their actual birthday. This, like your other ecommerce email campaigns, can help make your brand truly top of mind. Even before their actual birthday comes or even after the celebrations are over, they can create their birthday wish lists including potential products coming from your store. Of course, aside from the thoughtful remembrance of their special day, birthday emails are more effective when there is a promo included. Throw in a mystery birthday offer as it reportedly has the highest revenue at 502.4% compared to other promos like discounts and free shipping. And if your customers failed to respond to any of your birthday emails, trigger one to remind them about it. Reminder birthday emails generate an increase of at least 20% in open rates, click-to-delivered rates, average order value and revenue per email. When sending out a reminder birthday email, make sure to emphasize it by having a banner on top of the email. You’re birthday treat is still waiting for you! Don’t forget our birthday gift! Last chance to know your mystery birthday promo! Bonus: Another milestone event that you can celebrate with an email is an anniversary. It can be an email celebrating the customer’s one year of being an email subscriber. It can also be an email for celebrating an order purchased one year ago. And similar to birthday emails, include a gift, such as a discount on their next purchase. Go the extra mile and be thoughtful to your customers. It’s a form of relationship building and goodwill that can translate into a sale. Upselling and cross-selling is the act of introducing customers better or complementary products based on the product they are interested in. Customers are at the benefit of having a specified list of product options to choose from and businesses can benefit by making more money. In fact, upselling and cross-selling is responsible for 10 to 30% of all ecommerce revenues. However, do not confuse the difference between the two. Upselling is presenting options that will get users spending more on the same product or product type they are interested in. For instance, giving them options of faster processing speeds for a laptop they are interested in is an example of upselling. Cross-selling is presenting products customers can add to have a better experience of the product they recently purchased. Giving the option to buy a printer after buying a laptop is an example of cross-selling. Although upselling is 20 times more effective than cross-selling, doing a combination of both in your ecommerce email campaigns can be beneficial for your conversions. Like Amazon, make these emails effective by providing links that will take the customer straight to the product pages you are recommending. Stay within their purchase value. If your customer is showing an interest on a product that costs $300, present other similar choices (upsell) that will not go beyond $375 or 25% their budget. Show only relevant choices that fall within their buying capacity. Bundle with sense. The easiest way to defeat the purpose of cross-selling is to recommend products your customers may be unfamiliar with or have difficulty connecting together. For instance, bundling camera accessories, such as an SD card and a tripod, to an SLR camera purchase is wiser than an outdoor hat assuming that the SLR camera will be used for outdoor shooting. Do not overdo it. Keep things simple for your customers. 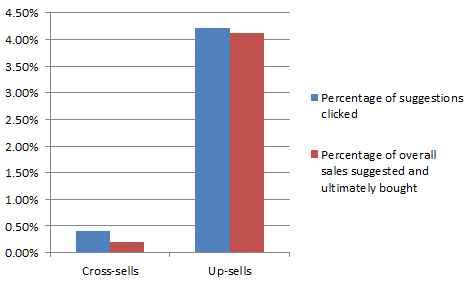 Avoid hard selling and sending them one upsell / cross-sell email after the other. This can damage not only your conversions, but your customers’ perception of your brand. To give your customers a sense of exclusive access to what’s new in your store; send them an email informing them of your latest offers and product arrivals. Giving them the feeling of accessing insider information is a fantastic way to encourage them to make their email addresses part of your subscriptions list. New offer emails, such as ‘New Arrivals’, season line previews, sale announcements, and limited supplies of new products are great themes to build on for your ecommerce email campaigns. The benefit of email marketing, such as this one, is your customer recipients are informed well in advance than others. For the rest of your customers who are not in your subscription list, they would have to at least drop by your site first to know of your new offers. Another benefit, of course, is it aids your conversions. Your customers who are anticipating the arrival of your new products are definitely in the buying mood, helping you sell majority of your stocks quickly and replenish immediately to serve other eager buyers. An ecommerce newsletter is one of the common emails sent out by businesses to engage with their customers and sell more products. It is also a type of email designed to communicate a lot of things all at once, such as your latest promotion, words from the CEO, event reminders, a survey, and a summary of published blog content among others. Since it contains so many information, getting readers to complete a specific call-to-action can be difficult. Below are some of the best practices to help you engage better with your ecommerce newsletter recipients. Focus on one specific topic. Obviously, since ecommerce newsletters tend to appear cluttered, concentrating on just one objective per newsletter can eliminate the confusion and make your communication targeted. Take this My Rewards emails from Starbucks as an example. The focus of the newsletter is the new Verismo System. The primary focus is to educate recipients of the coffee making machine. There may be links to a Pinterest contest and an educational material, but the Verismo System is still central to its content. The standard links to manage the customer’s rewards card are still there, but it is unmistakable what the newsletter is all about. Balance your ecommerce newsletter with educational and promotional content. Do not run the risk of bombarding your customers with emails prompting them to buy something every time you send one out. Unless it is an exciting announcement, like the arrival of new shoe styles, keep promotional ecommerce newsletters at a minimum and focus instead on sending your customers with educational materials, like links to a blog post you published on shoe care. Manage expectations at the onset by having a ‘Subscribe’ page on your site. As a way to control your Unsubscribe rates, let your customers know what they can expect once they sign up for your ecommerce newsletter, the nature of the content you will be sending, and how frequent it will be. Be creative with your subject lines. Especially if your brand is known to be fun and witty, having one-of-a-kind subject lines can have a positive influence on your emails’ open and click-through rates. Below are different subject lines used by Chubbies Shorts in their ecommerce newsletter campaign. These are subject lines you probably won’t expect to get in your inbox, and as such, can push you to click on them. Keep your email elements minimal. Having a simple ecommerce email template not only makes automating and designing easy on your end, but it makes your newsletter pleasant and scannable to your recipient’s’ eyes. Also, having ample white space in your newsletter also makes your links and call-to-action button easy to click on especially on mobile. Separately, social media and email are great marketing tools, but can yield more effective results when combined together. We previously discussed about email lists in Facebook Custom Audiences and you can take advantage of this feature to reach your customers who were unresponsive to your ecommerce email campaigns. This is a retargeting trick worth taking advantage of because it combines intent and interest in your retargeting ads. As a refresher, after installing a tracking code on your site, simply upload your email list before creating a custom audience using Ads Manager or Power Editor. This is a reliable strategy if you want to re-engage customers who have shown an interest in your email offer, but simply failed to convert. With so much growth potential to be gained, running ecommerce email marketing campaigns can truly aid you in making your business more successful. Ecommerce email marketing allows you to get personal with your customers. Of course, prior to them receiving your emails, there is a relationship already established. They have visited your site, bought an item from you, or responded to one of your offers. Email now becomes your means to nurture that relationship and turn these ordinary acquaintances into a long-term partnership. Your customers’ inboxes are also less public compared to Facebook, Instagram or Twitter. They welcome you into their private space so make this granted access count by sending relevant email messages designed to inform, educate, get their feedback from, reward, and make them feel good about themselves.